Professional partner teams from all over the world. Huawei : Create a sustainable smart city living. Register Now and Direct Developer Staff will get in touch with you soon! 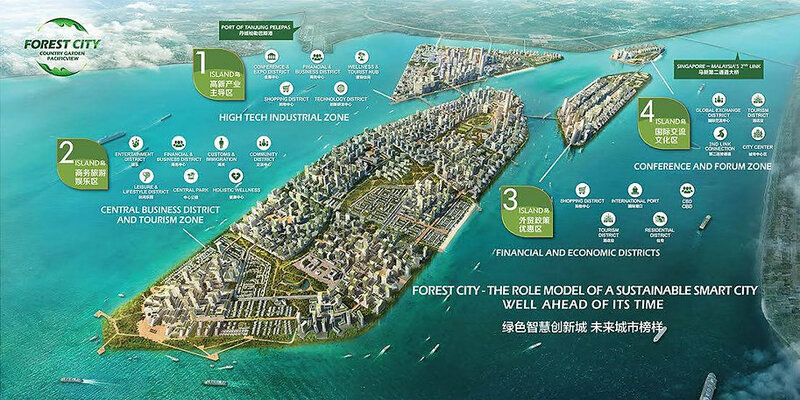 Forest City, is an iconic and extensively scaled project, a smart and intelligent city located near second link bridge of Iskandar Malaysia and adjacent to Singapore, making it a global destination. Spanning an area of 13.86 square kilometers stands 4 man-made island. Where urbanism and sustainability form an equilibrium, creating a dynamic, highly efficient and fulfilling international community. 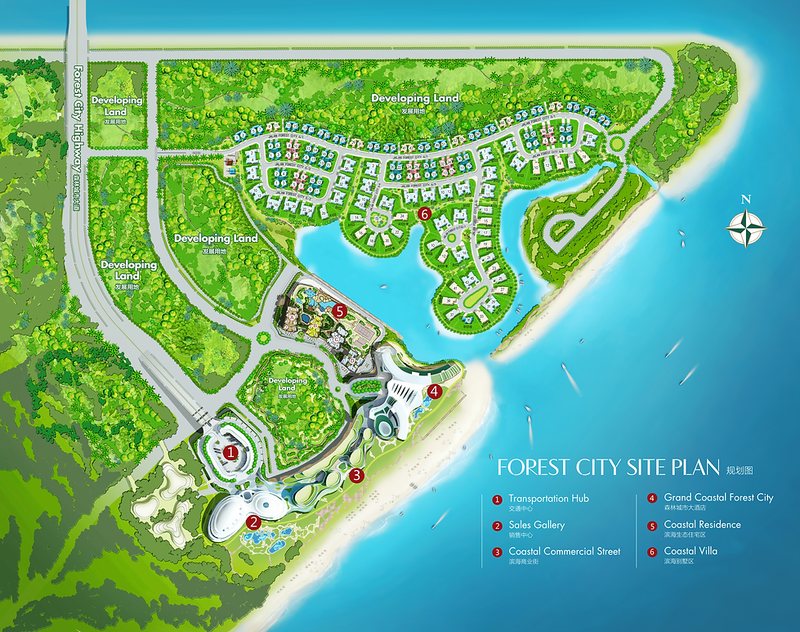 Forest City comprises of four (4) islands with 3,425 acres, surrounded by sea grass, flora and fauna. Touted as the largest reclamation works of its kind in Malaysia, Forest City is just a few hundred metres from Singapore and is within proximity to tycoon Peter Lim’s multi-billion-ringgit Motorsports City complex in the Iskandar region. 1. 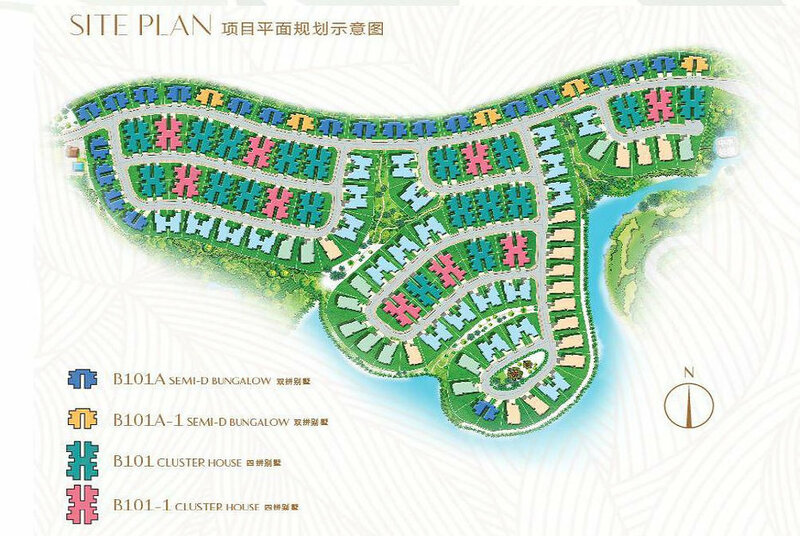 Measuring 1,817ha, the man-made island housing Forest City is close to three times the size of Ang Mo Kio town. 2. The Forest City project is valued at around RM600 billion (S$225 billion) and will rise off the Tuas shore. 3. The yet-to-be launched development is a joint venture between Chinese developer Country Garden Holdings and Johor state investment arm Kumpulan Prasarana Rakyat Johor (KPRJ). 4. The entire development is expected to take 30 years to complete and will include luxury homes, a mega shopping mall, transportation centre with light-rail and bus network, 5-star hotel and yacht club. 5. Work on the development has stopped since June 2014 after fishermen complained about its possible effects on their livelihood, while Singapore raised the issue of reclamation works affecting its coastal waters. 6. 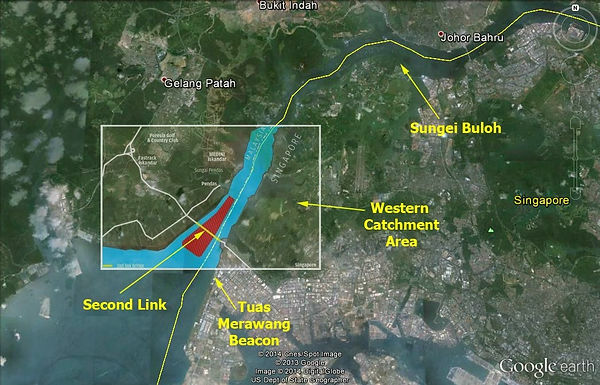 Country Garden is also developing a waterfront project in Danga Bay featuring 9,000 high-rise residential units. Covering 50 acres, phase one and two have launched with more than 6,000 units already sold. The site was purchased in 2012 for RM900 million. ISLAND 1: High Tech Industrial Zone — OPEN FOR SALE!! Covering acres, island 1 is planned as High Tech Industrial Zone, including the central business district, residential, shopping malls, IT industrial park, playground, transportation centers. 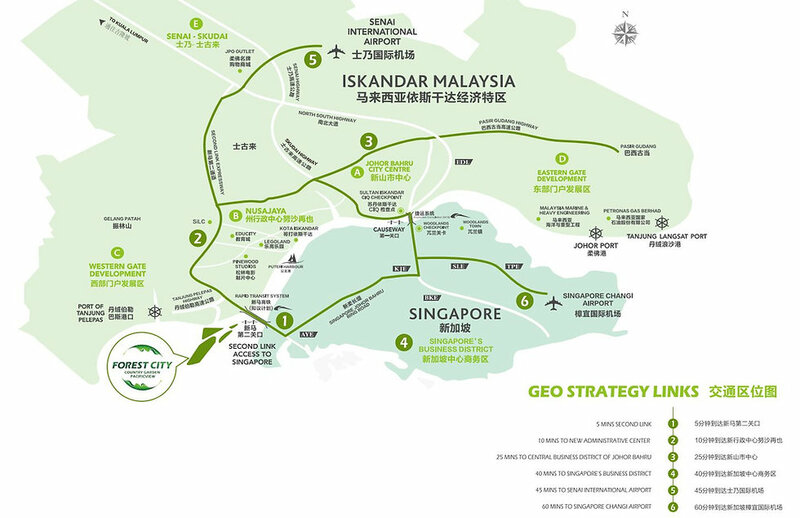 Covering 1895 acres, island 2 is planned as CBD and tourism Zone, including residential, Central Park, Sports Park, including the hospital and the ferry terminal. Island 3 spanning 405 acres & Island 4 with 164 acres including customs, duty-free shopping centers, convention, luxury hotels and international exchange center etc..
Country Garden is listed on Hong Kong Stock Exchange (HK: 2007; CTRYF), founded in 1992, with more than 20 Billion US $ sales in 2014. The company has more than 300 projects globally, and serving more than 3,000,000 homeowners worldwide currently. Actively developing overseas markets such as Malaysia, Australia, US and Canada. CGDB. 1st project in Malaysia, reached 1.6 billion US $ during launching. Receive top sales award in Singapore and Malaysia, the 2015 Asia-Pacific Property Award. Country Garden Pacificview Sdn. Bhd. (CGPV) is the master developer and creator of Forest City, a joint venture company between Country Garden Holdings Ltd (CG) and Esplanade Danga 88 Sdn Bhd, an associate company of Kumpulan Prasarana Rakyat Johor (KPRJ). Country Garden Holdings Ltd (CG)Country Garden Holdings Ltd (CG) is one of China leading real estate developer, with their businesses across the development and management of residential, commercial, and hotel. CG is listed in Hong Kong Stock Exchange on 20 April 2007 with the market capitalisation of approximately HKD 60 Billion, and is acknowledged by Forbes as Asia’s Top 30 companies. Currently, CG is involved in 168 on-going projects with over 60,000 staff employed. CG’s vision is to ‘Create a better society with our existence’ and CG’s mission is to ‘To shape a prosperous future through our conscience and continuous social responsibility’. CG was established in 1992, and is based in Shunde, Guangdong Province of China. Kumpulan Prasarana Rakyat Johor (KPRJ)Kumpulan Prasarana Rakyat Johor (KPRJ) is an Investment Holding Company mandated to plan and implement projects, focusing on infrastructure, for the benefits of and enriching the People of Johor. KPRJ’s mission is to ‘Successfully and efficiently implement projects that would derive maximum benefits for the State and enriching the People of Johor’. KPRJ was incorporated on 8th November 1995 and it is wholly owned by the Johor State Government. 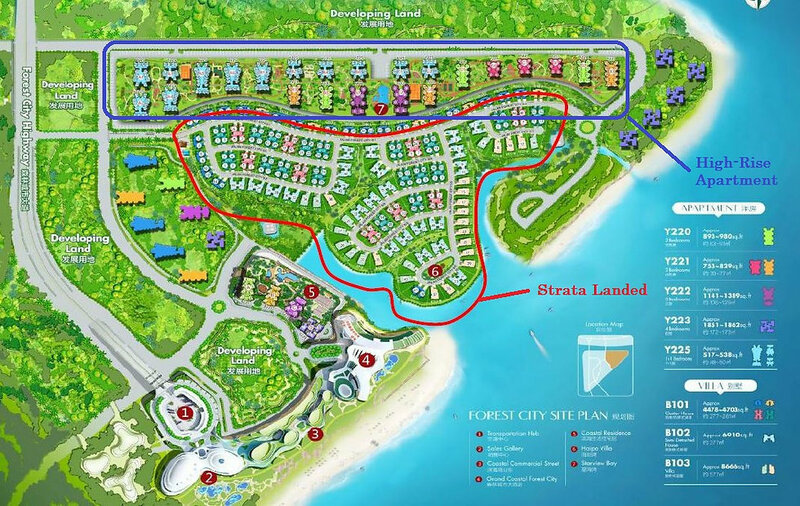 Forest City is located in Malaysia, Johor, Iskandar, near Singapore by the Tuas Checkpoint. Facing a vast sealine, and surrounded by EduCity, Afiat Healthpark, Ascendas Techpark, Southern Industrial Link Cluster, and Port Tanjung Pelepas. Approximately 75-180 sqm high-rise apartment with panoramic sea view, vertical greening, international brand furnishing, furniture and household appliances. It offers access to exciting urban facilities such as the marina commercial streets, infinity pool and conference hall. Exclusive 233 units of Strata Landed Housing! We do expect to sell out all landed units in short period! 4 Rooms + 1 Function Hall, 3 Living Rooms and 2 Parking Lots. 4 Rooms + 1 Function Hall, 3 Living Rooms and 2-3 Parking Lots. Built close to seaside, surrounded by large garden. A rooftop garden of about 150sqm can be used freely as family’s recreational and entertainment corner. 5 Rooms + 1 Function Room, 4 Living Rooms and 3 Parking Lots, living room’s ceilings are 7 meters high, and dining hall. There are a total of 4 president suites. The entrance for the owner and worker are separated, and a private elevator is installed in the house. 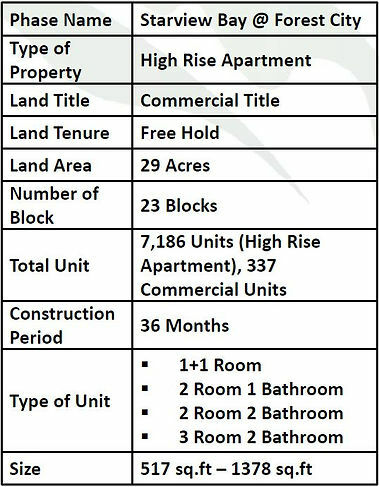 Phase 1 High-Rise Apartment Open for Sales NOW! 1bedroom from RM590K. 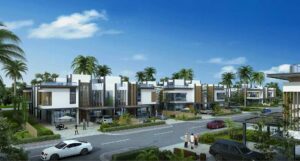 Island 1 Strata Landed House Open for Registration, Exclusive 233 units Landed House from RM5mil.